LT Hosting is Responsive WordPress theme well-suited for hosting corporate websites. This excellent theme comes with a clean and creative design that make it suitable for setting up any business-related website. It is a type of Internet hosting service that allows individuals and organizations to make their website accessible via the World Wide Web. The template framework comes with VPS Hosting, reseller hosting for making money with your own web hosting business. 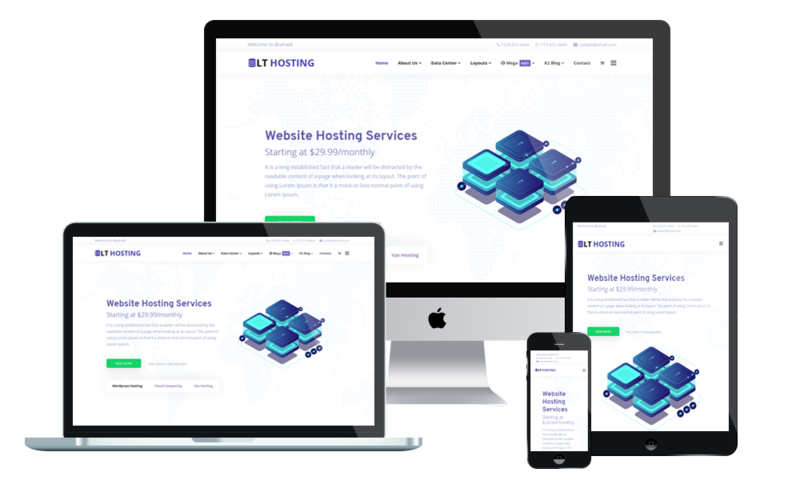 LT Hosting is 100% responsive that automatically adapts to any possible screen resolution of all mobile devices, displaying all the content in the best way. It comes with unlimited color and a color picker in the admin panel. Moreover, we offer support services like Bootstrap CSS & Hybrid framework, strong shortcode and drag-drop layout content… ready to help clients develop their websites. With about us page, you can add one featured image besides the content. It will make your page look more amazing. In addition, this is a great way to show off high quality services from your website. Here is a preview of the hosting table we have especially designed for your hosting-related services. You can update different hosting plans that your customers can choose the ones they want. It is simply to customize columns/rows and manage the hosting table from its built-in admin panel. You can set your blog posts to display on it. Write about news and trends in fashion industry, share your shops outfits for special events on social medias like Facebook, Twitter, Google+… This is the best way to improve your customers relationship via blog.